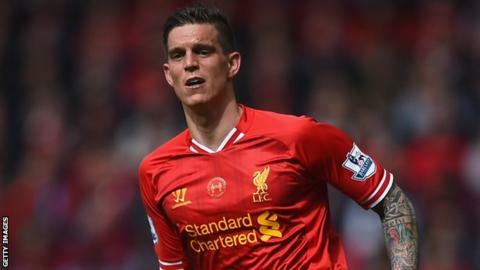 Liverpool defender Daniel Agger has returned to his native Denmark, after signing a two-year deal with Brondby. The 29-year-old has struggled with injury problems over the past 12 months and Liverpool have allowed him to leave the club for an undisclosed fee. "Liverpool have been such a big part of my life that leaving is extremely difficult," Agger said. "The opportunity arose for me to return home and at this stage of my career it felt like the right decision for me." The Danish club released a statement saying Agger has taken a "massive pay cut" to rejoin his old side. Agger has previously resisted attempts to lure him away from Anfield, notably from Manchester City, but having fallen behind new signing Dejan Lovren in the defensive pecking order, he has decided the time has come to move on. The Dane joined Liverpool from Brondby in 2006 in a £5.8m deal and made 232 appearances for the Merseyside club. He scored 14 goals and won the 2012 League Cup with the Reds, but lost in the 2007 Champions League final against AC Milan. Liverpool manager Brendan Rodgers said: "This is a decision Daniel has reached after much soul searching and deliberation. Agger becomes the third defender to leave the club this summer following the departures of Martin Kelly and Jack Robinson. Liverpool have also sold striker Luis Suarez and goalkeeper Pepe Reina.